The distraction of surveying enables me rapidly to take new points of view. A day or two of surveying is equal to a journey. Browse Thoreau's Surveys at the Concord Free Public Library. Visit the Surveying and Geodesy Collection at the Smithsonian Museum of American History. Learn more about 19th century surveying at the Osher Map Library. "For many years," Thoreau wrote in his chapter on "Economy" in Walden, "I was self-appointed inspector of snow storms and rain storms, and did my duty faithfully; surveyor, if not of highways, then of forest paths and all across-lot routes, keeping them open, and ravines bridged and passable at all seasons." In view of the ostensibly invaluable work that he had been doing for his neighbors, he wondered in mock resignation why no one seemed willing to pay him: "I went on thus for a long time (I may say it without boasting), faithfully minding my business, till it became more and more evident that my townsmen would not after all admit me into the list of town officers, nor make my place a sinecure with a moderate allowance." Thoreau may not have been paid for surveying forest paths, but he earned more as a surveyor than he did from any other occupation, and his jobs included surveying woodlots, farms, roads, and commercial properties, for which he received relatively steady remuneration, and which sometimes came directly from the State when he was paid by the Concord selectmen. He was, not surprisingly, ambivalent about this way of getting a living, in part because surveying was the necessary prelude to public and private exploitation of the land, but also because it forced him to do the bidding of overly demanding employers who, in his view, failed to appreciate the finer aspects of his work. 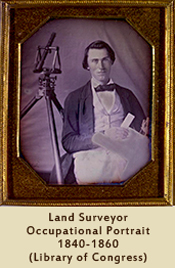 Nevertheless, between 1849 until shortly before his death in 1862, he gained a reputation as one of the best land-surveyors available in the rapidly developing Concord region. TO HARRISON BLAKE (AT WORCESTER). Mr. Blake, — I have not answered your letter before, because I have been almost constantly in the fields surveying of late. It is long since I have spent many days so profitably in a pecuniary sense; so unprofitably, it seems to me, in a more important sense. I have earned just a dollar a day for seventy-six days past; for, though I charge at a higher rate for the days which are seen to be spent, yet so many more are spent than appears. This is instead of lecturing...I have not only cheap hours, but cheap weeks and months. "Land surveying had much to do with the way the world saw Thoreau, but it also profoundly influenced the way Thoreau saw the world. Even while lecturing against the evils of getting a living, Thoreau acknowledged that he ran a surveying business, but he implied that his method of doing so was somehow compatible with a dissident, anti-materialistic way of life. Because he had chosen work that on one level accorded with his deepest beliefs, he had no need to fully disengage from it during his coastal explorations, his trips to Maine, or his four-hour walks in the Concord woods, where he was always ready to apply skills and practices inculcated by surveying." 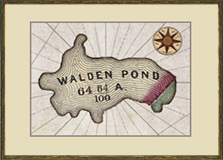 "The unpaid Walden Pond survey is strong material evidence that land surveying was philosophically important to Thoreau, but his reliance on surveying skills, equipment and data to enrich his nature writing, cultural criticism, and political commentary in Walden was by no means an isolated occurrence. 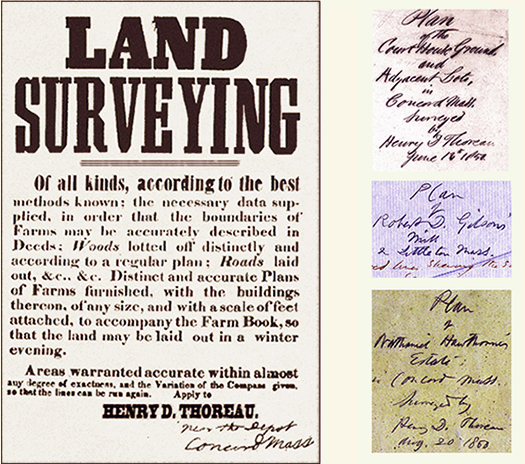 The large number of references to surveying in Thoreau’s published works, the frequency with which he takes on varied surveying-related identities and attitudes in these works, and the extent to which land-measuring vocabulary informs his political and environmental writing—all suggest that surveying was an essential rather than minor or peripheral component of the author’s life and character."